This video uses a PIR-IR60 hidden spy camera which uses 940nm IR LEDs to confirm that the infrared beam is invisible and cannot be detected by a smart phone camera. This video was created to answer a customer question that was submitted via email. The customer wrote the following. Thanks for taking the time to create the video for the PIR-IR60, it looks great. One question I have for you - if you point your camera-phone at the PIR's built in Infrared Illuminator at night, do you see a white glow on your phone giving away the location of the camera? 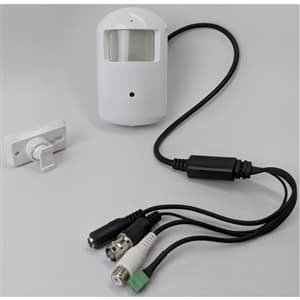 This video uses the PIR-IR60 hidden spy camera.